Dr. Toby Mountain at Northeastern Digital, Southborough, Massachusetts, remastered Diamond Dogs from the original master tapes for Rykodisc in 1990 with two bonus tracks and the original, uncensored, artwork. “Future Legend” stops at 1:01 and “Diamond Dogs” has 6:04 in this version. 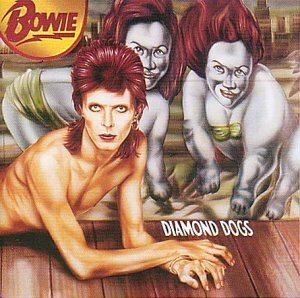 The third in a series of 30th Anniversary 2CD Editions, this release included a remastered version of Diamond Dogs on the first disc. The second disc contains eight tracks, five of which had been previously released on the Sound + Vision box set in 1989 or as bonus tracks on the 1990-92 Rykodisc/EMI reissues. 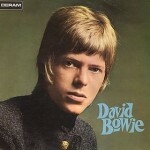 Following the break up of the Spiders from Mars, David returned to the recording studio as a true solo artist. A planned musical based upon George Orwell’s “1984” had to be shelved because the necessary permissions were refused by Orwell’s widow. Instead, David used the songs he had already written for it on a new album. Recording sessions commenced at the Olympic Studios in Barnes, South London in October 1973 and continued until February of the following year. Early recorded demos during this period include “Candidate” (written specifically for the “1984” musical) and “Take It In Right” which eventually became “Can You Hear Me”. In addition, a tape master from the sessions reveals that the album’s title track was originally “Diamond Dawgs”. David himself played most of the instruments although some other musicians were called upon to assist. These were Mike Garson (piano), Aynsley Dunbar (drums), Tony Newman (drums), Herbie Flowers (bass) and Alan Parker (guitar). It is thought that Ron Wood and Keith Christmas also helped on the recordings but these are not credited on the “Diamond Dogs” album sleeve. The sessions were Engineered by Keith Harwood, who had previously worked with the Rolling Stones, whilst Tony Visconti helped to mix. 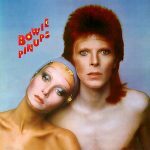 In February 1974 David visited Amsterdam where he appeared on the Dutch TV Show “Top Pop” miming to “Rebel Rebel”. During this trip, finishing touches were made to the album at Studio L Ludolf in Hilversum. 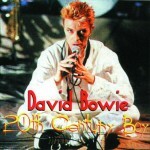 The original album cover featured artwork by Belgian artist Guy Peellaert showing a naked David as half-man half-dog. This was deemed as being too risqué by RCA in America who ordered that the dog’s genitalia be airbrushed out. A handful of the original, non-censored RCA sleeves did survive and one of these recently changed hands for $8000. It was planned to use another Guy Peellaert painting on the inside of the gatefold sleeve (based upon a photograph taken by Terry O’Neill) but this was dropped in favour of some images taken by MainMan photographer Leee Black Childers. 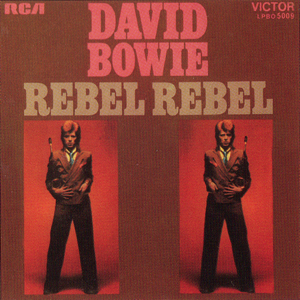 The first single to be released from the album was an edited version of “Rebel Rebel” although a specially re-recorded version of this song was issued as a single in the US, Canada and Mexico. The follow-up single was the full length title track (with the exception of Australia who issued a 2’ 58 edited version). Some countries – notably the US and New Zealand – issued “1984” as the second single, whilst Japan issued both “Diamond Dogs” and “1984” as follow-up singles. Incidentally, the audience that can be heard at the end of “Future Legend” and the beginning of “Diamond Dogs” was lifted from the Faces live album “Coast to Coast / Overture and Beginners”, the “Hey” is the voice of Rod Stewart!